For over 40 years now, Earth Day has been a day for both celebration and learning, to raise awareness of the issues our planet is facing from pollution, climate change, deforestation and species loss. Recycling, driving less, etc have been classic Earth Day suggestions, but here are 5 new things you can start today that will have a lasting impact for years to come. Did you know that most of our electronic gadgets still consume considerable amounts of power even when they’re switched off? This is because “off” is really “standby”, which is why they can come back on again at a moment’s notice from a remote control. Televisions, stereos, computer monitors and cell phone chargers are all examples of things we don’t use all the time, but continue to draw energy all the time. Something like a cell phone charger can be easily unplugged when not using it, but when it comes to things like televisions etc, that becomes quite a hassle. Luckily there’s a quick fix for that, the Smart Strip Energy Saving Surge Protector . Available from Amazon as well as many electronics big box stores, this can help save energy by shutting down power to peripheral devices when the primary device is powered off. Combined with power management settings on computers and newer flat panel TVs, this can significantly reduce the power consumption of your electronics. Hint: You probably don’t want to plug your Tivo into one of these strips though! Surprisingly, many people still use incandescent light bulbs. Whether due to a dislike for CFLs based on the early flickery, buzzy ill-colored types, or for other reasons, there is another solution. The new generation of LED bulbs, such as the Philips AmbientLED Dimmable LED Bulb , offer excellent energy efficiency (12w to produce equivalent light output to an incandescent 60w bulb) with a beautiful warm glow, rather than the harsh bright white of the early model LED bulbs. With standard base, they can be used in any indoor light fixture to save energy and money. Although they are currently quite a bit more expensive than incandescent bulbs, prices are dropping steadily. They will easily pay for themselves in energy savings, and then continue to provide warm inviting light for years more to come. Chances are, unless you live in an apartment, you’ll have something that requires watering. A lawn, flower beds, a vegetable garden, or even just some potted plants on your front steps. You can save money and give your plants healthier water by collecting rain to use for watering instead of tap water. Gone are the days of having a bright colored plastic barrel sitting outside your house, there are many options available for stylish rain barrels. 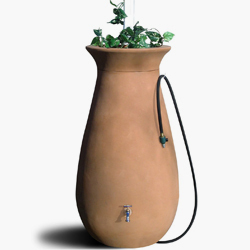 To see a few of the more popular models, take a look at these 5 Beautiful Rain Barrel Designs. Having a garden is a great way to connect with nature, make your space more beautiful and productive, and even save considerably amounts of money if you decide to grow your own vegetables. Hesitant about gardening because you’re wary of dusty, weed filled rows that need constant care? Don’t worry, there are much better techniques now! Check out Square Foot Gardening , a very efficient and easy way to grow more vegetables than you ever thought possible. To make it easy on your wrists, you can also try a set of ergonomic Radius Gardening Hand Tools . Whether you have a whole backyard to garden with, or just some space on your balcony, you can get started today and enjoy the rewards all summer. 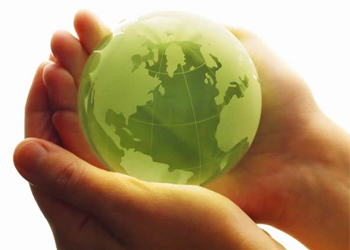 Most communities have some sort of environmentally themed group that you could get involved with. Green Drinks is an international networking event that is a fantastic opportunity to meet other green people, and get involved in community projects. Check if your city has an active Green Drinks event, and if not, start one! You can also contact the CaGBC or USGBC to see where a local chapter meets, to get involved that way. Maybe your passion is sustainable gardening, or protecting the forests, or helping impoverished regions get access to clean drinking water. Whatever your goal, there is a way to get involved. Start today! Can you think of any other simple steps that you could take that will lead to lasting change? Share them below in the comments!